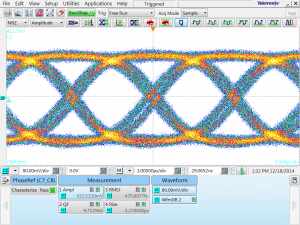 Serial 100G NRZ bit error analysis made possible! 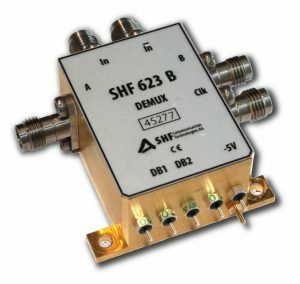 Continuing our commitment to the development of advanced test & measurement system solutions for future high speed system R&D, SHF is delighted to announce the availability of the long-awaited 100G demultiplexer SHF 623 B for up to 120 Gbps NRZ serial data BER measurements. Together with the already available 64 Gbps Bit Pattern Generator SHF 12104 A or 12105 A (1st from left), the 120 Gbps 2:1 Multiplexer SHF 603 A (2nd from left), and the 64 Gbps Error Analyzer SHF 11104 A (1st from right), this 1:2 demultiplexer (2nd from right) for the first time makes BER measurements possible at this range of ultra-high speed data rate. The availability of this solution is expected to play an important role in the future development of high speed, high capacity data centre infrastructures. This new demultiplexer (DEMUX) module features, for ease of use, AC-coupled differential input and single-ended outputs with excellent input sensitivity and phase margin, enabling error analysis at data rates of up to at least 120 Gbps. It comes along with a bias board requiring only one supply voltage; all operating voltages will be provided by the bias board. 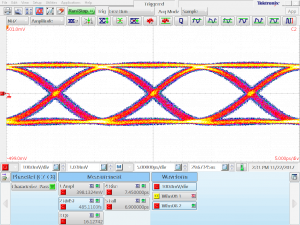 Typical output waveform of the multiplexer and demultiplexer are shown below. More information and the full data sheets can be downloaded here.